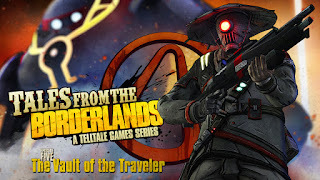 I finally made some time to finish up the last episode of Tales from the Borderlands by Telltale games. I can't say anything about this particular episode without giving out huge spoilers for the other four episodes leading up to this one. But I can say that they tied it all together and they answered all the questions they had asked earlier in the series. I love that so many decisions from the four earlier episodes ended up having an impact in episode five. It was really well done. Now that Tales from the Borderlands is complete I can honestly say it's my favorite Telltale adventure game. It consistently made me laugh and held my interest throughout all the individual episodes. I still like a lot of their other games, but this is my favorite. If you're the type of person who waits for all the episodes to come out in an episodic series, now's your chance to jump on this game.